You’ll begin your epic Asian adventure in Singapore, the cosmopolitan hub of Asia, with its outstanding architecture, vibrant food scene and rich history. You will have the chance to spend two-nights exploring the city at your own pace before embarking Norwegian Jewel; once on board you will glide across the sea to the remarkable ports of Phuket, Penang & Langkawi, famed for their beautiful beaches & ancient temples, before enjoying an overnight stay in Kuala Lumpur – home to one of the tallest buildings in the world! Once you disembark in Singapore, you will catch the short flight to Siem Reap (Cambodia) for a three-night stay. 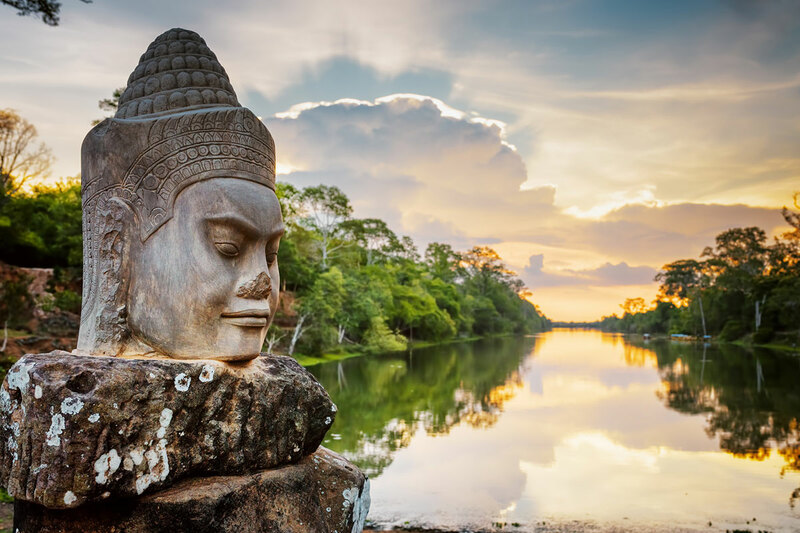 During your time here, you will have the opportunity to enjoy a full day tour of Angkor Wat & Angkor Thom – one of the most famous archaeological sites in Cambodia – as well as a fascinating ‘floating village’ tour. Your home at sea is the Norwegian Jewel and you can bet she’s got it all. As well as offering some of the largest suites at sea, there are staterooms to accommodate every style. When it comes to entertainment, this ship’s filled with excitement: 16 dining options, 15 bars and nightclubs and that’s just the beginning. Enjoy the warm days at sea on the Sports Complex where you can play basketball, volleyball and dodgeball or perhaps spend some downtime in the hot tub or the library. For those who love the water, there are a plenty of pools to choose from for adults and kids alike. With at least 9 complimentary dining venues serving everything from local cuisine to international favourites, you will never be stuck for choice, in fact, the hardest decision you will have to make is which one you want to eat in that day! If you want something a bit special, be sure to check out their speciality dining venues where, for a small cover charge, you can enjoy some of the finest cuisines at sea from an American-style steakhouse to Haute French cuisine, and even a sushi and teppanyaki option. Make sure to bring a bigger pair of trousers! Norwegian Cruise Line’s selection of Premium All Inclusive voyages are the perfect way to keep an eye on your on board spend, with all tea, coffee, soft drinks and premium alcoholic drinks and cocktails included, plus your on board gratuities – you don’t have to worry about your wallet at the end of the cruise! Book today with one of our experts to avoid disappointment! Prices are per person, based on 2 adults sharing the lowest grade of stateroom available. Prices are subject to change and availability and can be withdrawn or amended at any time. Flights are based from London, may be based on indirect services; regional departures, direct flights, hotel, cabin and flight upgrades may be available at a supplement. Transfers included in the cost where specified. On board facilities vary by ship, please ask for more details.